CAUTION: As you may now becoming aware, there are many stories about miraculous cancer cures circulating the internet and bookshops. Cancer support veterans like Grace Gawler, have seen ‘miracle cures’ come and go and sadly most were not valid. Indeed it has taken Grace decades to correct errors in the Ian Gawler cancer cure story – a story she was involved in 24/7 . Please fact check and cross check all ‘miracle cure claims’ and do not abandon conventional therapies. Some common cures persist such as MMS, Hydrogen Peroxide, Hulda Clark’s ‘Parasiste Cure’ (It is not widely known she died of cancer) The Gerson Diet and many others. Visit www.gracegawler.com for more information about cancer solutions. These two stories are related whether we are examining cancer healing miracles of Mary McKillop by religious means or patients with advanced cancer who claim to have been cured by lifestyle and meditation, thus creating the link to a spiritual intervention causing the healing. Here is where the waters muddy – Are miraculous acts of healing associated with innate, natural biological responses and can these be triggered at a point in time when faced with death? Intangibles such as faith, will to live, love, hope, inspiration may weave a complex partnership between biology and spirit reaching a place where the criteria for healing can come together – AKA The Spontaneous Remission. The Australian quotes Sydney oncologist David Bell, co-wrote a book on so-called spontaneous remission. He said he knew of about 400 confirmed cases worldwide over the past 150 years. For hundreds of years, the phenomenon of spontaneous remission has fascinated the greatest minds in cancer medicine. US researchers Caryle Hirshberg and Brendan O’Regan authored a classic which are a must have for anyone researching the subject: “Spontaneous Remission: An Annotated Bibliography“. A regular visitor to my blog, Bob Ellal has a website and a true story worth reading. Bob’s remission was hard-earned – now 12 years after being diagnosed with stage four lymphoma in 1991 he was given six months to live. He read everything he could about people who had survived supposedly terminal illnesses. One common thread emerged— says Bob: “They utilized the mind/body connection as a complement to Western allopathic treatment. For the next six months, I was given double doses of CHOP chemotherapy to destroy the rampant disease that littered my pelvis—and that had fractured my hip.” Bob incorporated visualisation methods into his his cancer treatment program. Few books and websites mention the challenge of dealing with setbacks and their psychological affect on patients. Bob’s shares the strategies that assisted him during these times and his spirit of survival shines through as he partners with allopathic medicine and CAM to achieve the best result possible – his survival! I recommend a visit to Bob’s website and his book for anyone going through cancer – particularly men. The book is insightful, inspiring, candid and oozes with honesty of someone who has walked the path, battled the adversities and not given in. Highly recommended! Visit Bob’s website for a great read about cancer survival. You can read sections of his book online for free as well as ordering online. the book is available for download on Smashwords for free. It’s also on Kindle for $2.99 or in hard copy. 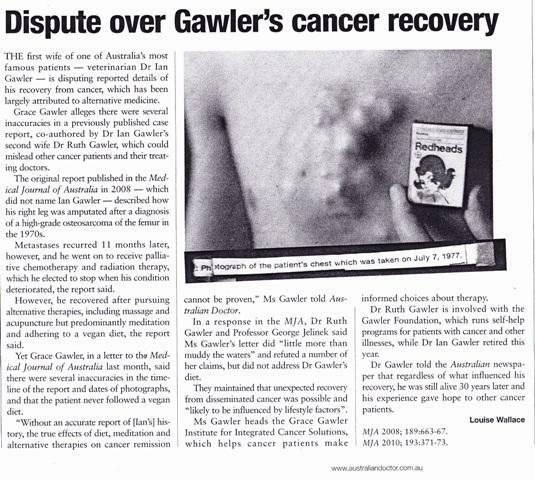 A determination to tell the accurate version about Australia’s most famous recovered cancer patient, Ian Gawler, and to uphold ethical standards for therapists at the Gawler Foundation she co-directed, have cost Grace Gawler dearly. In the short space of time immediately post marriage, all forms of adversity slammed Grace. Soon, even her best selling book, Women of Silence, had its contract rescinded and copyright returned. Next, Grace found herself silenced by the media in Australia. In contrasts, while visiting overseas for life saving operations between 2002 -5, Grace experienced no such media silence and lectured in England, Ireland, and Holland to full and enthusiastic audiences. 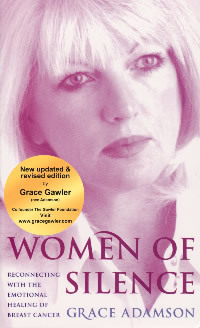 Beating the Silence in The Age, 2007, was the only significant media coverage Grace has been able to secure since leaving the Gawler Foundation until the recent Medical Journal of Australia (MJA) 2010 article and somewhat sensationalized coverage in the Australian on Frid, 8, 2010. The Age article, Beating the Silence tells more of Grace’s remarkable journey. As Hemingway said …’Courage is Grace under pressure’ Nothing could be more accurate about Grace’s tenacity over decades to correct inaccurate versions of the story she was so intimately involved win. The driving force was a moral imperative that cancer patients need accurate information on which to make treatment decisions. Max Awarenness: Video – Women of Silence – An interview with Grace Gawler on Breast Cancer and Emotional healing. Although a tad sensational with an image of quarreling wives – Adam Cresswell has written a courageous article that reflects the truth of Australia’s most famous cancer remission story. To be 100% clear, this is not personal in any shape or form. What has happened over the years is a morphing and misreporting of Ian Gawler’s story so that it resembles virtually nothing of the truth of what actually occurred. The story is still amazing and it still offers hope – but there is a public responsibility to tell it accurately. I addressed these errors in the MJA 20 September 2010. By Pip Cornall – Grace and Ian Gawler worked as a close knit team for three years to achieve his famous remission from bone cancer in 1978. This was remarkable in those days. BUT – from the moment the first incorrect telling of their story appeared in the Medical Journal of Australia (MJA) followed by an article in the Adelaide Advertiser – THINGS went from bad to worse. The MJA article gave it credibility. The victims were the myriads of cancer patients who tried to emulate the incorrect version – namely that meditation and vegan diet cured his bone cancer after all other conventional treatments failed. Grace was deeply concerned that the story she was intimately involved in had been so misreported. Over the decades the volumes of cancer patients following the ‘myth’ grew because of massive media coverage. Grace tried to set the record straight but the media refused to tell her story. NOW – 32 years later – The Australian, the nations primary newspaper, has run her corrected account of their cancer healing story – albeit as papers do – somewhat sensationalized – portrayed as a fight between wives. Nevertheless – Grace is elated – the truth is finally told – it is not personal – it is a moral neccessity to tell the correct story. Because the story was incorrect from the outset oncologists and practitioners like Grace have to pick up the pieces when emaciated, immune compromised patients limp in to our practices after extreme diets and long meditations have failed – the time spent in ‘experimenting with such ‘alternative’ treatments is critical because all the while the cancer spreads – click here to read the article.